A night on the town will be warm and elegant in the Cassidy Dog Sweater Dress in Gold by Pooch Outfitters. Sweater dress with eyelet and ribbon details. Adorned with a chiffon flower pin with gem center. 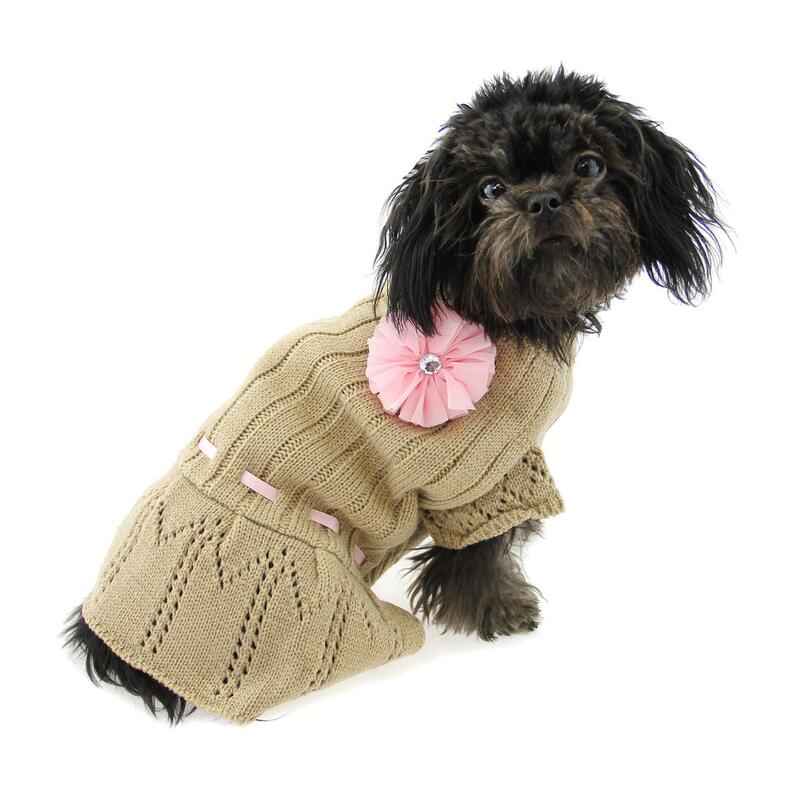 Your pup will be cozy and elegant in this refined and sweet dog sweater dress with eyelet and ribbon details. The highlight of this soft look is the pink chiffon floral pin with a center rhinestone. The pretty pink is repeated at the waist with a woven satin ribbon. You'll love all of the soft textures of this sweater with a subtle gold thread running throughout the knit. The ribbed neck and belly provide a nice fit and the high-cut tummy will keep your pup clean and dry. This lovely dog dress is not too frilly and has a refined silhouette that won't detract from your dog's natural good looks. This is a lovely transitional dress that is perfect for Thanksgiving, Valentine's Day, or a chilly Easter. The removable floral pin can be used on other outfits too! This dress from Pooch Outfitters is made of 100% acrylic for the perfect knit look. Remove pin before laundering. Hand wash in mild detergent. Lay flat to dry. X-Small: Chest 12" Neck 8" Length 8"
Small: Chest 14" Neck 9" Length 9"
Medium: Chest 16" Neck 11" Length 11"
Large: Chest 19" Neck 12" Length 13"
X-Large: Chest 22" Neck 14" Length 16"
Cassidy Dog Sweater Dress - Gold Customer Photos - Send us your photo! Olivia loves this sweater dress. Not only does it keep her warm, but it looks so adorable on. For added warmth, you can even add a little turtle neck underneath! I love shopping at Baxterboo. I've done it several times and every time I've been very happy with the product... customer service and delivery. I also love the coupon certificate! Thank you Baxterboo!